Let’s give it a quick introduction: I am owner of an orcabot 0.43 since some weeks now. I made it work and print and also started modding it. Now I am at the point where I want to change some firmware settings. Unfortunately Igor the printer just as it is, no sifteare,, no docu and no one to ask. I did not find a single picture that matches my Bord. I guess it is a gen 6 electronic of some kind. I thing I red something about backup. I will of course try that because the printer is working with whatever firmware is on it now. Enclosed is a picture of the board. Thanks for any ideas on that thing. Orcabot 0.43 with heated bed. Your going to have to clean that chip (isopropyl alcohol and a cotton bud) and read the number on it. I don’t have an LCD installed and currently don’t use ABL or Software retraction. I guess too many of these kind of things can cause the problems. Only thing I have is a heated bed. It would also be O.K. to know the firmware that is currently on the device reconfigure it and reinstall it just with the fan modification. Is there a command to read the installed firmware version? Edited 1 time(s). Last edit at 02/07/2018 12:48AM by NozzleMover. Most id themselves over serial on power on.. But, it does not tell you anything about what thermister type you have. Edited 1 time(s). Last edit at 02/07/2018 02:18AM by Dust. The chip is the one from the Gen6 electronics, as far as I understood the corresponding RepRap Wiki. And I want to be using the the 1284 settings of the sanguino in Arduion although it sais 1048 on the chip, right? Or just see what works best? The chips says "ATMEGA 644P"
It also says its "20AU" so its a 20mhz chip... you need to look at the crystal and see what speed its actually running at probably only 16, but you need to set ardunio IDE to correct speed or serial communications will not work. I just got my printer setup again which uses the GEN6 board. I was looking at updating the firmware. Did you get 1.1.8 to run on the GEN6 board? Once added you are ready to burn the bootloader from the Arduino IDE via the ISP method. Since I do not have an ISP programmer I used an Arduino Uno R3 as an ISP. 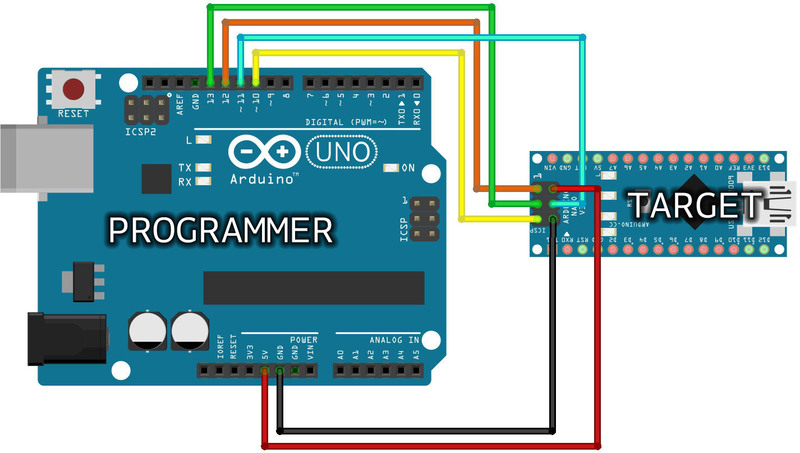 You need to connect the Uno to the PC and open the example sketch ArduinoISP (it is number 11). On line 81 I uncommented #define USE_OLD_STYLE_WIRING and uploaded the sketch to my Uno. Once uploaded I powered both the GEN6 and the UNO off and wired the Uno to the GEN6's ISP pins as shown in the link below. Click Tools. Set Board to "Sanguino"
Click Tools. Under Programmer, choose "w Arduino as ISP". Arduino will begin burning the bootloader. The process takes about a minute or less. After Arduino reports "Done", press the reset button on your GEN6 board. Disconnect the power from the Uno board, unplug the USB cable and disconnect ISP wiring. You're ready to load firmware! Sorry if this seems overly simplified but I was tired of searching the net for all of this info and second guessing myself on if this would work on a GEN6 board. So if this saves one person that frustration it is worth it. Well time to move on to getting manual mesh bed leveling setup so I can compensate for the +/- .004" that bed leveling wasn't able to correct. Good luck! Click more info, this will reveal an install button. lol yea that is a bit easier! I was searching the net and trying to follow the path from 00xx days till now. Yes my board and my expertise was out of date a lot has changed since I built my printer in 2010-2011. Honestly the changes are rather amazing that has happened. Thank you for the updated info!! Wow that sounds like it has saved me a lot of trouble. To make sure I got it right: This is the procedure to compile and then install the new firmware, right? Hopefully it also works this way on my Mac. Did you back up your old firmware first? How to validate that the backup worked? How to bring it back on the board in case you need to? Then load up marlin and make sure in configuration.h the motherboard line is "#define MOTHERBOARD SANGUINOLOLU_12"
If no errors then you can try an upload. Edited 2 time(s). Last edit at 02/16/2018 04:49AM by Dust. Edited 1 time(s). Last edit at 02/18/2018 04:25AM by Dust.